It's a rare treat to stay in a hotel that cares for the local environment, people and culture as much as it cares for its guests. It's bigger than I'd expected, a two-storey Earthship in a remote valley, a day's walk from the nearest town. That's how my friends and I reach Feynan Ecolodge, in fact. After a three-hour drive from Amman, Jordan's capital, to Dana, a 4000-year-old cliff-top village of stone houses, we set off on foot, following a dirt track that twists and turns down the side of a canyon like an intestine. As we descend from an altitude of 1200 metres to 325 metres, the temperature climbs. And climbs. By the time we stop for lunch in the shade of one of the valley's few juniper trees, it's clear we've walked into a Jordanian heatwave. Our guide makes a small fire and hands around cups of wormwood tea to revive us, but back on the trail I start to feel defeated by this relatively easy 14-kilometre hike. Then we see it. 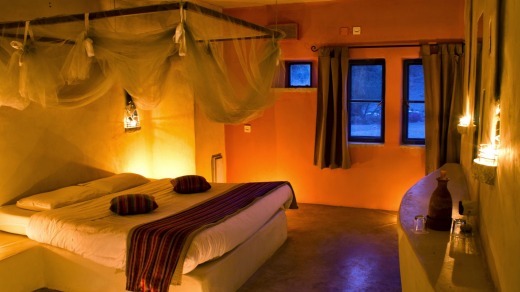 Jordan's first ecolodge appears like a mirage, its sand-coloured walls seemingly growing out of the landscape. Speechless, we file inside, wipe our faces on chilled towels and re-hydrate with tall glasses of ice-cold lemon and mint juice. Built by Jordan's Royal Society for the Conservation of Nature (RSCN) in the 308-square-kilometre Dana Biosphere Reserve, the nation's largest nature reserve, Feynan was designed by renowned Jordanian architect Ammar Khammash to resemble a caravanserai (a resting place for camel trains). It has an open courtyard at ground level and 26 rooms upstairs. Khammash was also inspired by Coptic monastic communities the architect visited in Egypt. "I wanted a very humble place where people can retire like a monastery," he has said. Indeed, Feynan feels more like a retreat than a hotel. My twin room is as minimalist as it is earthy, with unpainted, unadorned walls, white cotton bed linen and mirrored niches for candles. The lodge is entirely off-grid. Rooftop solar panels generate just enough electricity for the lodge's kitchen, office and en suite bathrooms (which also have solar hot showers) – less than a two-bedroom apartment in Amman would consume, says Nabil Tarazi, who greets us when we arrive. He's the founder of EcoHotels, which has managed Feynan since 2009 to allow the RSCN to focus on its conservation activities. All I want to do is lie on the cool, polished earth floor and never see the sun again, but after a reviving shower and a change of clothes I'm ready to join the others for a nightly Feynan ritual: strolling to a nearby hilltop to sit on still-warm rocks and watch the sunset. A Bedouin guide serves us tea from a fire-black kettle. All is quiet. We're enveloped by rust-red mountains. The day's heat wave has mercifully broken. 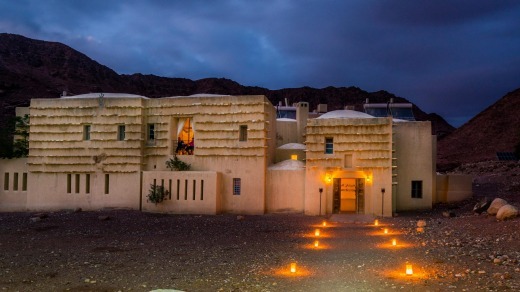 Returning to the lodge, we find it transformed, aglow with hundreds of candles handmade locally by Bedouin women. It's just one of the many ways the lodge benefits the people who live in the valley. All the staff and food come from nearby villages. The flatbread served at the lodge, for instance, is made by a Bedouin mother of five in her tent. Bedouin drivers shuttle guests from the main road in their own utes (rather than Feynan having its own vehicles and employing drivers). 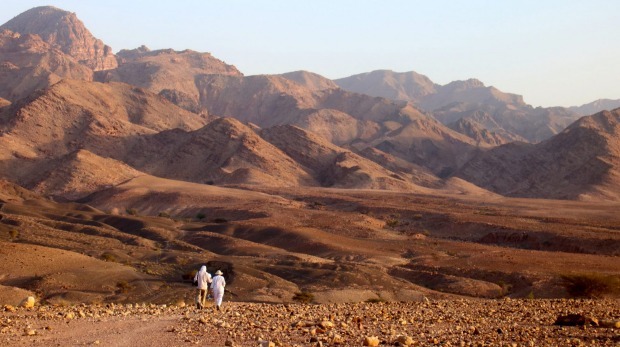 And while some activities, such as guided hikes and cooking classes, are included in the room rate, Bedouin cultural experiences such as traditional coffee-making and "a day with a shepherd" are run by locals to supplement their income. "So your stay benefits 80 families, or about 400 people," says Tarazi. A bell rings, another monastic touch, summoning us to a candlelit dinner on the terrace. It's an Arabic-style vegetarian buffet. All the food at the lodge is vegetarian, for three reasons: environmental (plant-derived foods have less impact than meat), practical (limited electricity limits refrigeration) and cultural (reflecting traditional Bedouin habits). No alcohol is served, either, to respect the community's wishes, but guests are welcome to BYO. After dinner, Tarazi gives a half-hour talk about the lodge's eco-credentials. To avoid using disposable plastic bottles, water is served from locally made clay jars that also keep the water cool. All waste is either recycled or composted. On the 30-odd days a year when it's cold enough for an open fire, the lodge uses charcoal made from crushed olive pits, saving an estimated four tonnes of trees annually. And 50 per cent of the lodge's income goes towards conservation. Talk over, we join Tarazi on the rooftop for a stargazing session; guests can sleep up there under the stars during the summer months (the lodge is open year-round). We have an early start the next morning – to continue our six-day hike to Petra – but spending even one night at Feynan has been a treat. Few hotels approach perfection, and eco-lodges have added challenges, but Feynan comes close, in caring for both nature and culture, and creating a truly Jordanian oasis of sustainable serenity. Louise Southerden was a guest of Feynan Ecolodge. Emirates flies from Sydney to Amman via Dubai. See emirates.com/au/ Feynan is a three-hour drive from Amman, the last eight kilometres off-road; the lodge can arrange four-wheel-drive transfers for JD12.5 a car. The best time to go is March to May and September to December.